When maintaining power or control is mission-critical, there’s no room for error or unreliability. 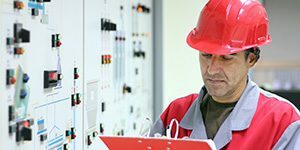 From hospitals and industrial plants to transportation systems and data centers, industrial control systems have a big responsibility – to keep everything running smoothly and safely. These controllers are command central for maintaining safe operation of a wide range of interconnected electronic and mechanical components. 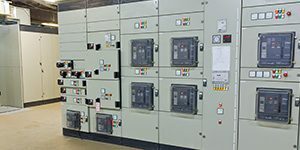 Typically used to synchronize every aspect of the power system, including backup power generators, these advanced controllers use distributed logic system to constantly receive and monitor data from remote sensors on a range of process variables and to communicate commands – including shutdown or emergency power – if the variables go outside the set points for safe operation. As a global leader in the power space, our client has high expectations from the parts that make up its products. And VCC was more than ready to step up to the challenge. Because these systems monitor and control a range of high-power machines and other equipment, safety was at the top of the priority list. By using a lens that delivered a 180-degree viewing angle, operators could notice alarming and react faster from a wide range of viewing angles. 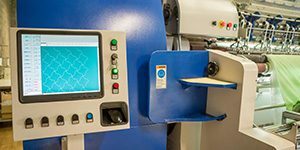 Another key design consideration was keeping costs down, both in assembly and production time while adhering to very specific design requirements. VCC’s build your own indicator feature gave the client the convenience and control of a custom product, with the added benefit of in-stock parts that were ready to go. Combining a high-output through-hole LED and a rugged 10mm moisture-sealed lens, the solution also provided easy maintenance and the ability to switch out the lens for another color right on the panel without any tools. 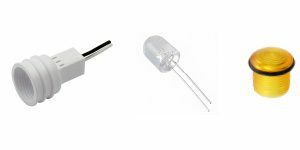 From the VAOL10 Series includes through-hole LEDs. While a white lens was used in this application, other colors are available including green, blue and green. To further customize — and optimize — the illumination for the controller panel, a watertight Fresnel lens with mounting hardware included was used to not only enhance the durability, but also to provide a 180-degree viewing angle for added safety. 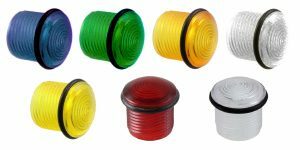 This controller’s indicator uses an amber lens, but these lenses are also available in yellow, white, blue, red, green and clear. Spiral mating threads used in the design exceed all test criteria for NEMA 4, for durability and convenience in changing out lenses. Build your own indicator provides the best of both worlds — the design benefits of a made-to-order indicator, combined with the speed and efficiency of assembling with standard parts. Using VCC diffusion ring technology, end users can take advantage of wider visibility, which ultimately improves reaction times and safety. This safety extends well beyond the room where the system is being monitored. Depending on set points and systems being controlled, the operator can warn other workers, patients or employees of possible harmful chemicals and other risks when equipment variables go outside set points. A low-profile design enhances light output by reducing ambient light effect on the lens. In addition to the time and assembly saved through VCC’s build your own indicator option, the low-profile design and optimal lens delivers a viewing angle of 180 degrees thanks to the diffusion ring technology. This feature delivers more than convenience, it provides enhanced safety for end users and those operating the equipment these systems monitor.